The pressure tank with replaceable membrane is an element used in hydraulic applications for sanitary water circuits, such as pressure groups in combination with pumps or devices such as anti-water hammer. The main purpose of the pressure tank is to give water at a steady pressure, in order to limit the pump hourly starts, safeguarding its working and electricity consumption. This is possible thanks to precharged air pressure stored between the membrane and the internal metal surface of the tank. When the pressure increases, the air cushion compresses letting the water filling in the tank, and then keeping it under pressure to be reused when the user requests it. 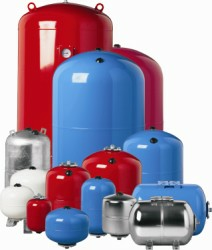 The shape of pressure tank can be vertical or horizontal. Pressure tank can have a max working pressure that changes according to the needs of the system; it can be also available in galvanized or AISI 304 stainless steel for high quality performance.